Pottery is a very versatile kind of archaeological artefact. As archaeologists we love using it for dating our sites and the features that occur on them, and ceramics specialists also often use a variety of methods to try to work out where different types of pottery were made, in order to talk about distribution patterns and reconstruct ancient trade. However in recent years pottery has also been used as evidence to talk about the consumption of food and drink in the past; after all, most pottery – then as now – is simply what people used to store, prepare, and serve food. A previous post has already discussed the evidence for foreign foods at late Iron Age Silchester and pointed out how diet appears to have been changing during this period. This post will look at the pottery from this period in a similar light – whereas plant remains can tell us about what was being eaten in the past, pottery can inform us about how those foods were being eaten, which I hope to show is of equal importance. The pottery being used and produced in southern Britain during the late Iron Age and early Roman periods (broadly, the first centuries BC and AD) went through some quite fundamental changes and was highly distinct from vessels being used previously. Earlier Iron Age pot forms are typically very simple ‘open’ or ‘closed’ forms, i.e. corresponding to modern ideas of jars and bowls. It is thought that much of what was prepared in these simple vessels was ‘wet’ food such as stews and porridges, which, in the apparent absence of any real tablewares would have been eaten communally from the pot in which the food was cooked, or perhaps from a single service vessel. In the first century BC, however, pottery changed radically. A wider variety of forms became available in southern Britain, some of which seem to have been meant for display and specifically designed for the service of food and/or drink. The changing range of pottery forms in the region of East Anglia, c. 125 BC (top) through to c. 10 BC (bottom) (image: J.D. Hill (2002)). Many of these forms, such as plates, flagons, beakers and small bowls originated in northern Gaul (France) and Belgium, and signify drastically changing ways of consuming food and drink. The use of plates, for example, shows that ‘drier’ dishes were sometimes being served, whilst flagons suggest an emphasis on communal drinking associated with food. 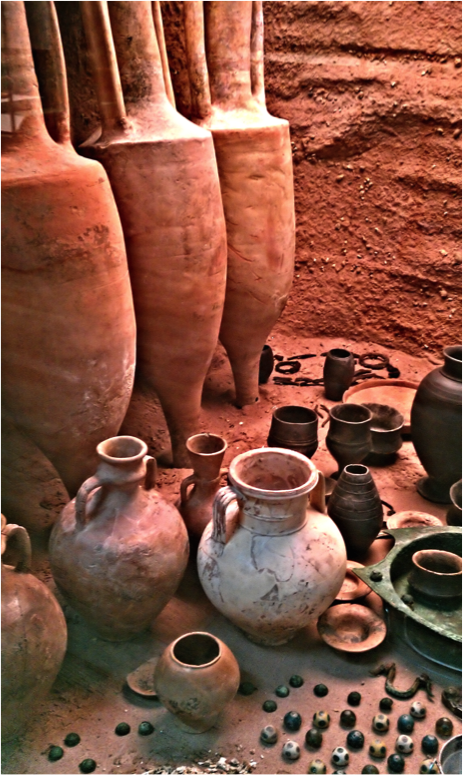 Finds of amphorae – large ceramic containers for transporting wine, olive oil, dried fruit, etc. from the Mediterranean – in wealthy burials such as that at Welwyn Garden City in Hertfordshire, show that the elites of this period had access to imported foodstuffs and seem to have developed a particular fondness for Roman wine. In addition, the ceramics used to make many of these tablewares are of far higher quality than those known in Britain previously, and would have presented a more diverse range of colours, textures and sounds when used at the table, contributing to a completely different dining experience than previously. 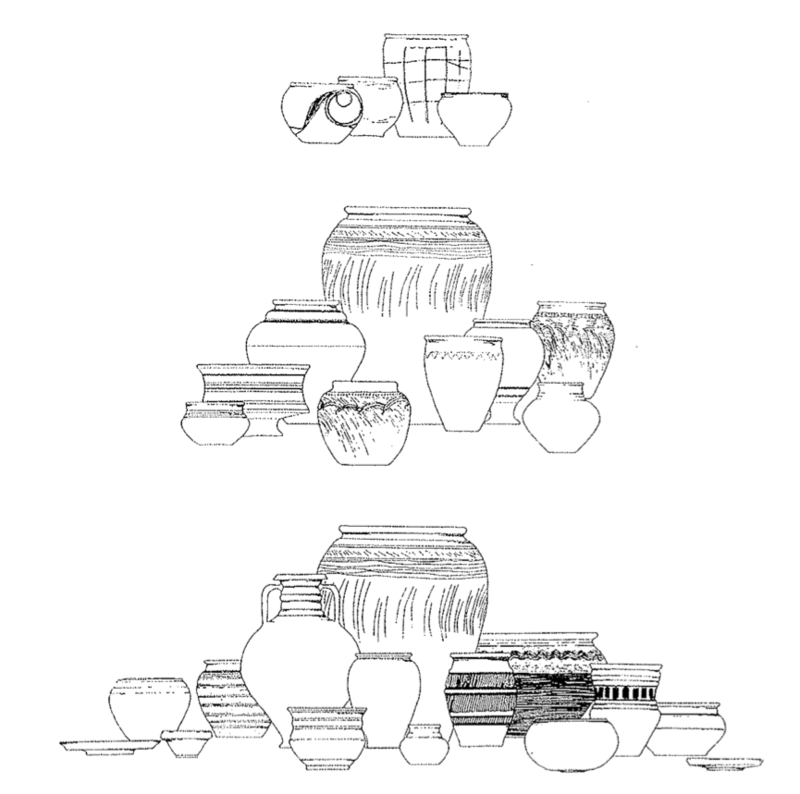 Reconstruction of the Welwyn Garden City cremation-burial, showing a selection of flagons, bowls, plates and drinking vessels, as well as several imported wine amphorae. Image by Andres Rueda via Wikimedia Commons [CC BY 2.0 (http://creativecommons.org/licenses/by/2.0)%5D. All of this change has been interpreted in different ways by archaeologists. In the 1980s it was popular to see the use of new kinds of pottery and foodstuffs as the preserve of tribal elites, who used their tablewares to advertise their access to expensive imports and their knowledge of exotic ways of eating and drinking (Haselgrove 1982; Millett 1990). There may be a degree of truth in this, but recently more emphasis has been put on the changing role of food and drink in everyday life in the late Iron Age. In particular, it is revealing that not only the use of pottery changed in the late Iron Age, but also that pottery production changed. The introduction of the potter’s wheel, for example, suggests a move towards mass-production, in turn suggesting that demand for pottery increased as a result of changing consumption habits. This probably means that people in general – rather than the elites in particular – wanted more good-quality pottery with which to serve food and drink (Hill 2002). But why did food and drink consumption change in the ways they did? The archaeology of the late Iron Age highlights growing links between Britain and the rest of Europe, and we have seen that this is well reflected in the pottery in the form of Mediterranean amphorae and northern French tablewares, themselves based to a large extent on Roman vessels. So does this mean we can in fact say that people were taking on a ‘Roman’ or ‘Mediterranean’ style of dining? More likely is that people in Britain were simply becoming more aware of the wider world – including but not limited to the Roman world – at this time, and that this was reflected in their dining habits. There is a growing body of evidence to suggest that individuals and groups were relocating from the continent to Britain around this time (e.g. Fulford 2000; Timby 2013), and it is indeed conceivable that similar movement in the other direction also occurred. Food, being an important factor in signifying cultural identities and developing and invoking memories, is likely to have played an important role in how these communities perceived themselves, and perhaps in how they wished others to perceive them. In this context we may see certain parallels between the late Iron Age of southern Britain and our modern world. Today, the process that we would call globalisation has resulted in a great degree of awareness of other cultures, and in particular has greatly expanded peoples’ knowledge of practices of eating and drinking that were traditionally only a feature of dining overseas. One now only needs to go into a high street cookware shop to find items such as woks, tagines, bamboo steamers, etc., whereas a generation or two ago these would not have been readily available; similarly, one needs only to take a look around the average British kitchen to find that such items are not only used by people from overseas or their descendants. Perhaps we can envisage a similar situation in the final generations of the Iron Age (Pitts 2008)? Britons may have become accustomed to meeting Gauls, Belgians, or Romans (or their descendants) in their everyday lives, and their dining habits may have been influenced by new ideas of eating and drinking that these individuals brought from their homelands. A similar process of fusion may have also occurred between these immigrant communities and the pre-existing British dining customs. Drawing conclusions of this kind from archaeological evidence is riddled with complications, and I emphasise the fact that any single line of interpretation is usually inadequate to explain the plethora of evidence at our disposal. However, the evidence seems clear in showing that the uses of pottery in southern Britain were changing over the course of several generations prior to the Roman conquest. This almost certainly reflects changes in the ways in which food and drink were consumed, and tallies very nicely with the plant remains now being investigated from contemporary sites such as Silchester. Quite what it all means, however, remains a matter for future work and speculation. Fulford, M.G., 2000. Synthesis. In Late Iron Age and Roman Silchester: excavations on the site of the forum-basilica 1977, 1980-86. London: Britannia Monograph 15, pp. 545–564. Haselgrove, C., 1982. Wealth, prestige and power: the dynamics of late iron age political centralisation in south-east England. In C. Renfrew & S. Shennan, eds. Ranking, resource and exchange: aspects of the archaeology of early European society. Cambridge: Cambridge University Press, pp. 79–88. Hill, J.D., 2002. Just about the potter’s wheel? Using, making and depositing middle and later Iron Age pots in East Anglia. In A. Woodward & J. D. Hill, eds. Prehistoric Britain: The Ceramic Basis. Oxford: Oxbow Books, pp. 143–160. Millett, M., 1990. The Romanization of Britain, Cambridge: Cambridge University Press. Pitts, M., 2008. Globalizing the local in Roman Britain: An anthropological approach to social change. Journal of Anthropological Archaeology, 27(4), pp. 493–506. Timby, J., 2013. A French connection? A brief review of early Roman pottery production in southern Britain. In H. Eckardt & S. Rippon, eds. Living and working in the Roman world: Essays in honour of Michael Fulford on his 65th birthday. Portsmouth, RI: JRA Supplementary Series 95, pp. 155–168. This entry was posted in Guest Blogs, How do we know about Roman food? and tagged amphora, Gaul, globalisation, Late Iron Age, Roman pottery, Silchester, Welwyn Garden City on March 7, 2015 by zkamash2013.